Members who have made previous purchases on our website will automatically qualify as a TW Travel Member. Please sign in to your account to view our Member Deals. Explore Borneo’s wildlife, culture, scenery and of course the beautiful coastline on 2 wheels ! This cycling holiday provides a unique insight into the wildlife of Borneo as well as it’s beautiful western coast. This experience / trip is confirmed and we are running low on availability. Book now to avoid disappointment. Please remember to enter Traveller Details before clicking on "Book Now". Reserve now with a Deposit. ~ 1 night stay in Hostel basing on quad sharing. ~ arrival and departure transfers. ~ 4 breakfasts; 3 lunches & 4 dinners. ~ service of an English-speaking Lead Cyclist Guide, Support Cyclist(s) and support vehicle. 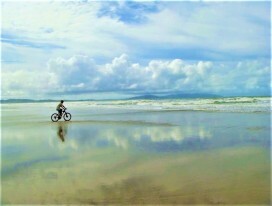 ~ use of off-road, 27-speed gear system (JAVA) mountain bicycle, inclusive of helmet, rain poncho during cycling days. ~ water and energy boosting snacks for enroute consumption during cycling days. You can reach us via the following ways. © 2017 Powered by Travel Wander LLP. All Rights Reserved. Business Registration Number T16LL0743G. Travel Agent License TA2910.